I graduated! Senior year was rather drawn-out, so it is good to be done. My plans for the near future are also set. During the summer, I will be attending the REU at Penn State (as I have already mentioned). This actually starts in less than a week. In the fall, I will be an undergraduate at Harvard. The extent to which I keep posting will likely depend on how much time and energy I have at Penn State, along with the topic of my research project (about which I know next to nothing now). However, I do know that I will resume blogging about more expository (and older) topics, since I have finished talking about my last project. It would be criminal to leave off class field theory right before the Artin reciprocity law, so I—as a mildly self-respecting blogger—will post a few times more on the subject. In addition, I’ve been trying to collect together the various posts I’ve done on algebraic number theory into some sort of sheaf of notes, but it has yet to attain even quasi-coherence. I know I will regret this someday, but here is the current messy version. I’ll try to flesh these out a bit over the next few weeks and clean it up. So far, except for Chapter 0, it literally consists of my blog posts, one after another. This post continues my series on representation theory in complex rank, begun here with a discussion of Deligne’s interpolation of the representation categories of the symmetric group, introduced in his 2004 paper. Semisimplicity is the basic structure theorem for Deligne’s categories, and I would be extremely remiss in my discussion of representation theory in complex rank if I did not say something about it. So, let’s review. In the first post, I explained and motivated the definition of Deligne’s categories . Incidentally, Deligne did the same for the other classical groups, i.e. , but I shall not discuss them. The categories , are defined as the pseudo-abelian envelope of the -linear category generated by objects , where the hom-spaces are free on the equivalence relations on , and composition is given by a combinatorial expression which is polynomial in the rank (hence interpolable). Now, we just have an abstract category with formal objects and morphisms corresponding in no obvious way to anything concrete. To prove it is semisimple, we cannot use therefore techniques such as those in the proof of Maschke’s theorem of Weyl’s complete reducibility theorem. But we can do it by appealing to what I discussed in the second post of this series: by proving that the endomorphism rings are semisimple and the category is nonnilpotent. In fact, since direct products and factor rings of semisimple rings are semisimple, we only need to prove that the algebras are semisimple (in addition to nonnilpotence). This endomorphism ring (depending on the size and the rank ) is an important object, called the partition algebra, and you can look it up e.g. here. But I don’t know how to prove directly that the partition algebra is semisimple. So I will follow Deligne (and Knop) in the (inductive) proof (which will also imply semisimplicity of the partition algebra). I will do this in two steps. First, I will use a little bit of combinatorics to show that when , the category is nonnilpotent. Next, I will use this to prove semisimplicity. I have a math blog? What is this? The main excuse I had for ignoring Mount Bourbaki for the past month or so was the Intel science competition, which ended last week. It was a lot of fun—I met many interesting people and enjoyed numerous pleasant conversations. To my surprise, I ended up coming in third place. I was quite stunned by this especially after hearing the finalists called before me–I have to say that I was genuinely amazed by every project that I saw. I’m the guy on the left looking in the wrong direction. Other than this, I also know now what I’m doing this summer. I’m going to do an REU at Penn State, where I’ll be working on a topic that I should probably find out about soon. What I’m going to do next fall is still undetermined. As of late, I’ve been reading up on some logic and model theory and a bit of ergodic theory (from Walters’ book, which I recommend). I tried to study Spanier while I was at Intel though didn’t get very far. And I sincerely will try to get some entries up soon. I don’t know whether I will be able to keep my promise of Grothendieck topologies just yet. Apologies for the embarrassingly bad pun in the title. First, it’s necessary to talk about distributions on an arbitrary open set , which are not necessarily tempered. In particular, they may “grow arbitrarily” as one approaches the boundary. So, instead of requiring a functional on a Schwarz space, we consider functionals on the space of smooth functions compactly supported in . However, we need some notion of continuity, which would require a topology on . There is now the tricky question of how we would require completeness of the topological vector space , which we of course desire. We can get such a topology by talking about “strict inductive limits” and whatnot, but since I don’t really find that particularly fun, I’ll sidestep it (but not really—most of the ideas will still remain). I’ve created two new pages: a bibliography, and a collection of old writings. The bibliography is for me to list the sources I use (or plan to use shortly) in writing this blog. It’s also a list of books that I’ve found helpful in various fields, so perhaps it will be useful to others learning about the same type of material. Currently I’ve found the books by Folland, Introduction to Partial Differential Equations, and Taylor, Partial Differential Equations, to be excellently written and well motivated. Taylor’s book also ties in the differential geometry (more so than Folland). The style is uniformly clean but leisurely, and both books are more-or-less self-contained. Also, I collected together some old notes I’ve written for various reasons and posted them in case anyone might find them helpful. For instance, I wrote an expository paper on integral equations a few years back for a seminar course, which I was pleased to stumble across, since I did not remember it. That may become a blog post in the future. While reading Feynman’s autobiography a few days back, I came across a funny story. As an MIT undergraduate, he explained to a fellow student in a drawing course a “special” property of the French curves they used: “At the lowest point on each turn, no matter how you turn it, the tangent is horizontal. His fellow students thought apparently thought this was remarkable and spent some time playing around with the curve, despite having already taken calculus. I ran into the same situation today. While working out an exercise on an ordinary differential equation in the plane, I wondered if a smooth curve whose tangent vector is always pointing in the same direction as lies on a straight line through the origin. A reparametrization by arc length allowed me to figure it out quickly. A few minutes later, though, I realized something. The condition above was just that the tangent vectors of are parallel—so is then a geodesic with respect to the usual connection on , up to reparametrization! And geodesics in this case are just straight lines. So it should have been immediately obvious to someone who had spent a month blogging about nothing (and immersed in) but differential geometry. This was probably a bad example, but I think the point stands that perhaps books ought to emphasize these kinds of little insights more to avoid creating this kind of fragility. Amusingly, Feynman says he found a similar problem (albeit obviously with more complicated material) when a graduate student at Princeton talking to people who worked there. Next time I will go back to actually blogging about mathematics. I’ve been busy as of late with college applications and a science competition. But now I have a bit more time, so I shall try to resume posting. 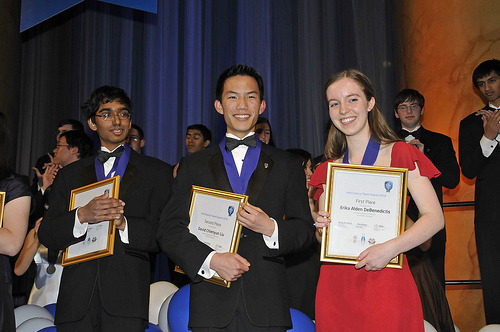 Anyway, speaking of science competitions, I participated in the Intel International Science and Engineering Fair in 2007 with a self-guided project. The bulk of it dealt with Riemann integration in abstract spaces and the potential for generalizing certain constructions in analysis to this setting. The paper I submitted is here.